Toyota Racing Development TRD 2000GT "Did you see that dope wide-body MR2 in the TRD booth at the Import Auto Salon?" was the most asked question by the thousands who attended. Without a doubt, the MR2 made a lasting impression. If you were one of the few unfortunate people who were not able to see it, you're in luck. After the Auto Salon, the Toyota had a date with our cameras. Having had a full day to study her, all we have to say is WOW! - and were not just talking about the fine lady next to the car. 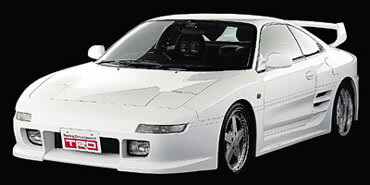 Fact is, we still haven't gotten over the effect TRD's 2000GT wide-body kit has on the MR2's sheetmetal. Before we saw this kit, we didn't think the MR2 needed much help. The wide-body MR2 was the creation of the sales and marketing division of TRD USA, Inc. The platform they decided to start off with was the 1991 Toyota MR2 Turbo. The MR2 not only has the visual appeal to attract consumers, but also has a large following of enthusiasts throughout the U.S. Since TRD carries a wide selection of parts for the '91-'95 MR2, the stage was set. Buffing Up The "2" You can easily detect the difference between a regular MR2 and the TRD MR2 by the buffness of this vehicle. The TRD 2000GT wide-body MR2 kit adds a total of two inches on both sides of the Toyota, increasing the overall width of the MR2 by four inches. The body kit is constructed from fiberglass and retains all the factory reinforcements. The kit comes with new front fenders, front and rear bumpers, rear quarter panels, trunk lid, wing and side skirts. The integration of the body kit onto the MR2 was performed flawlessly by PJ of PJ Bonifacio Motorworks in La Puente, California who reported that the TRD kit was one of the easiest the company has ever installed. PJ spent countless hours transforming the Toyota from showroom stocker to show stopper. After the installation of the kit, pristine Viper red and super-white paint was applied to the 2's sheetmetal. Japan-spec front signals now replace the original orange pieces and the orange side markers in the front bumper were replaced with moldings offered through TRD. The rear lights have also been upgraded with '95-up units further providing a fresh look all around. Enhanced Suspension Did you expect TRD to leave anything stock on the MR2? Not likely. The Toyota has undergone a battery of modifications to every facet of the vehicle, including the suspension. The factory shocks and springs were the first to go. In their place resides a coil-over system from TRD. The TRD coilovers allow for adjustability in ride height and shock dampening creating a customized ride. Beefier front and rear sway bars increase the cornering ability of the Toyota while front and rear strut tower braces keep the chassis from flexing. To ensure the MR2 comes to a safe halt, TRD installed cross-drilled front and rear rotors, beefed up the brake pads and added stainless-steel braided lines at all four corners. Not only does the TRD 2000GT look like a race car, it can corner like one. Inner Settings No show/race car is ever complete without custom interior. The factory leather seats were replaced with reclining TRD-flavored bucket seats. Keeping the driver securely in place is a Sabelt five-point harness. A TRD boost gauge mounted on a gauge pod relays boost pressure to the driver. At the driver's finger tips lies a TRD steering wheel which still utilizes an airbag. Carcraft Custom Interiors in Torrance, California was contacted to redo the factory trim, subtly wrapping the MR2's insides with custom charcoal ggraysynthetic leather. Rolling Hard With the added room for rolling stock complements of the 2000GT's fender flares, it is only natural to stuff some large-diameter wheels underneath. DAZZ Motorsports of Baldwin Park, California was contacted to provide the wheels and tires for the Toyota. What better way to make a statement than with some deep-dish fat-lip wheels and DAZZ elected to use its line of Racing Hart wheels on the MR2. A custom set of three-piece C5s were made specifically for the 2000GT Toyota. The MR2 rolls 18x8.5-inch wheels in the front in tandem with Pirelli rubber, while the rear runs 19x9.5-inch wheels with Pirelli rubber providing the footprint. Can you say "mad lip?" 'cuz the rears flex nearly five inches! At the track, Volk Racing TE37s are utilized. TRD For The Future After beating the information from one of our contacts at TRD, we have learned that the 2000GT MR2 is just the beginning of what is to come. The company plans on importing more Japan-spec parts from TRD Japan for U.S. consumption as well as supplying parts for the Lexus line-up under the "L Sport" banner. If all holds true, TRD USA, Inc. should be a heavy hitter in the performance and show market in the year 2000 and beyond. Like many of you who saw the TRD 2000GT in person, the editors of Import Tuner were also in awe. Our very own Shaun Carlson described the TRD 2000GT best by saying it was a combination of many vehicles, "from the front it looks like a baby Acura NSX, from the side it looks like a mini Ferrari F40 and from the rear it looks like a BMW 850." No matter how you look at it the TRD 2000GT is trick. Be on the lookout because TRD is back in a big way!